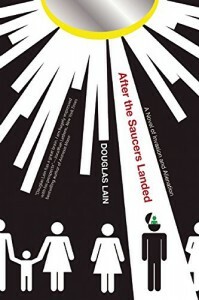 To start with the good: It is unlike any other alien invasion books I've ever come across. It provides an answer to the question which bother us all: what if the discovery of aliens showed that they were nothing but completely underwhelming, with their jumpsuits and new age-y religion. The bad: I had a constant feeling when I was reading this that it was trying to convey something to me, but I couldn't find out what. It is partly a criticism on society I suppose, but I didn't think it was a particular strong one. The ugly: I was bored. A lot. Part of the book is really confusing, and while I think that's intentional, it made that I could never get invested in the story. Basically, I was counting the percentages I still had to read on my Kindle. All in all, an interesting concept, but its execution didn't work for me. Thanks to the publisher and Edelweiss for providing me with a free copy of this book in exchange for an honest review!